Background: Modified pyrimidines is a very important pharmacophore core of naturally occurring and synthetic bioactive compounds, interacting with the synthesis and function of nucleic acids, interfering with biosynthetic pathways and competing for the same binding sites of naturally occurring pyrimidines. 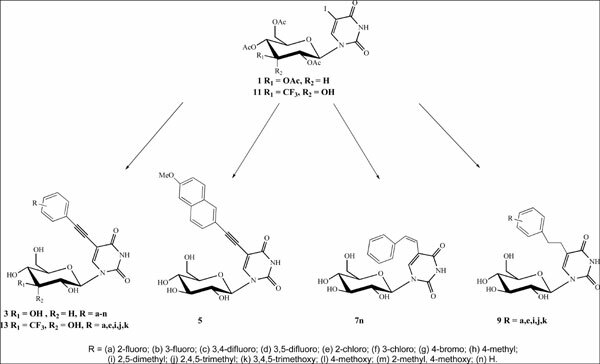 Method: C5-arylalkynyl glucopyranonucleosides 3, 5 and -3´-C-trifluoromethyl-β-D-allopyranonucleosides of uracil 13, were synthesized using the one-step Sonogashira reaction under microwave irradiation and subsequent deprotection. Hydrogenation of acetylated 2a,e,i,j,k,n with NiCl2 and NaBH4, gave C5-phenylethenyl 6n and C5-arylethyl 8a,e,i,j,k uracil pyranonucleosides, which upon deacetylation, afforded the unprotected pyranonucleosides 7n and 9a,e,i,j,k, respectively. Results: The newly synthesized compounds were evaluated for their potential cytostatic activities in cell culture. Conclusion: The results of the cytostatic examinations indicated that compounds 2a,e,i,j and 12c,d are suitable candidates for further biological studies on lead drug and structural optimization. Keywords: C5-pyrimidine pyranonucleosides, cytotoxic activity, microwave irradiation, sonogashira reaction, synthesized compounds, synthetic. Keywords:C5-pyrimidine pyranonucleosides, cytotoxic activity, microwave irradiation, sonogashira reaction, synthesized compounds, synthetic. Abstract:Background: Modified pyrimidines is a very important pharmacophore core of naturally occurring and synthetic bioactive compounds, interacting with the synthesis and function of nucleic acids, interfering with biosynthetic pathways and competing for the same binding sites of naturally occurring pyrimidines.